Acesulfame-K is a white crystalline powder C4H4KNO4S that is a cyclic organic potassium salt. It is an artificial sweetener with zero calories and has a sweetness that is 200 times more intense than sucrose, which is more commonly known as table sugar. However, it has a slightly bitter after-taste. This artificial sweetener has been approved since 1988 and is currently being used in food and beverages. 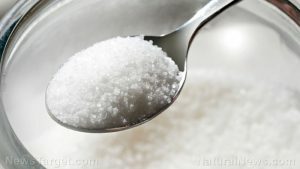 It is usually found in a mix with other sweeteners, such as aspartame and sucralose, to mask the bitter aftertaste when sweeteners are used on their own. Oftentimes, it is used as a flavor-enhancer or to preserve the sweetness of sweet foods. It can be found in soft drinks, protein shakes, drink mixes, frozen desserts, baked goods, candy, gum, and tabletop sweeteners. It is listed in the ingredients on the food label as acesulfame K, acesulfame potassium, or Ace-K. In Europe, it is sometimes referred to as E950. It is sold in the market under the brand names Sunnett or Sweet One. Although it is considered safe by the Food and Drug Administration (FDA), some are convinced that it has potential dangerous health effects. The first safety tests on Ace-K were conducted in the 1970s. These tests indicated the compound could be carcinogenic or cancer-causing, in rats. But the validity of these tests has been questioned over the years. In 1996, the Center for Science in the Public Interest (CSPI) urged the FDA to do more tests on acesulfame-K before allowing its inclusion in soft drinks. Agencies say that even though the initial safety test in 1970s was flawed, current research on Ace-K does not prove its safety. The CSPI says that despite the shortcomings of the early research, there is an association between acesulfame-K and cancer. Furthermore, there is also evidence that aceotoacetamide, which is created in the body as it breaks Ace-K down, can lead to thyroid damage in lab animals. A study also found that the chronic use of Ace-K in male mice was linked to possible changes in brain function over a period of 40 weeks. The harmful effects of acesulfame-K are based on the improper testing and lack of long-term studies. It contains the carcinogen methylene chloride. Long-term exposure to this substance can cause symptoms such as headaches, depression, nausea, mental confusion, liver effects, kidney effects, visual disturbances, and cancer in humans. Like other artificial sweeteners, acesulfame-K is controversial. Some claim that they can disrupt metabolic processes and interfere with appetite regulation, body weight, and blood sugar control. Several observational studies have highlighted a link between consumption of diet drinks and development of obesity, type-2 diabetes, and metabolic syndrome. Long-term consumption of acesulfame potassium may raise the blood sugar levels or insulin. One animal study suggests that long-term use of acesulfame potassium may impair brain function. Studies also show that high daily intake of artificially sweetened drinks could affect the early development of babies during pregnancy and could cause pregnant women to give birth prematurely. Moreover, Ace-K critics raise concerns about its potential to cause cancer. A cancer-causing chemical called methylene chloride is used in the manufacturing of Ace-K. It affects the central nervous system, liver, cardiovascular system, and blood. This carcinogen chemical causes irritation to the respiratory tract when inhaled. Some of its symptoms include nausea, vomiting, and headache. When ingested, it may cause irritation in the gastrointestinal tract with vomiting. It may also affect the skin that it may cause irritation, redness, and pain. It is also harmful for the eyes as its vapors can cause eye irritation that can produce pain, inflammation, and temporal eye damage. Although regulatory authorities in the United States and the United Kingdom have declared this artificial sweetener as safe, the studies used to prove its safety do not support the scientific standards that are usually required to make such decisions. Acesulfame potassium is an artificial sweetener that has zero calories used in food and beverages such as soft drinks, protein shakes, drink mixes, frozen desserts, baked goods, candy, gum, and tabletop sweeteners. It may cause cause cancer, diabetes, and premature birth. It may also disrupt metabolic processes and interfere with appetite regulation, body weight, and blood sugar control.